Join We Are Change Atlanta, Architects and Engineers for 9/11 Truth and WeAreChange.org as we present: “Engineering Change: A Blueprint for 9/11 Truth” This event is a call to action for We Are Change chapters all over the world to come together with the Architects and Engineers for 9/11 truth to create “Local Action Groups” which will present the cumulative evidence gathered by ae911truth.org and present it to your areas local representatives, media, and communities. Together we are a mighty force and voice for pursuing 9/11 truth and justice for all of those who have and continue to suffer because of these attacks. 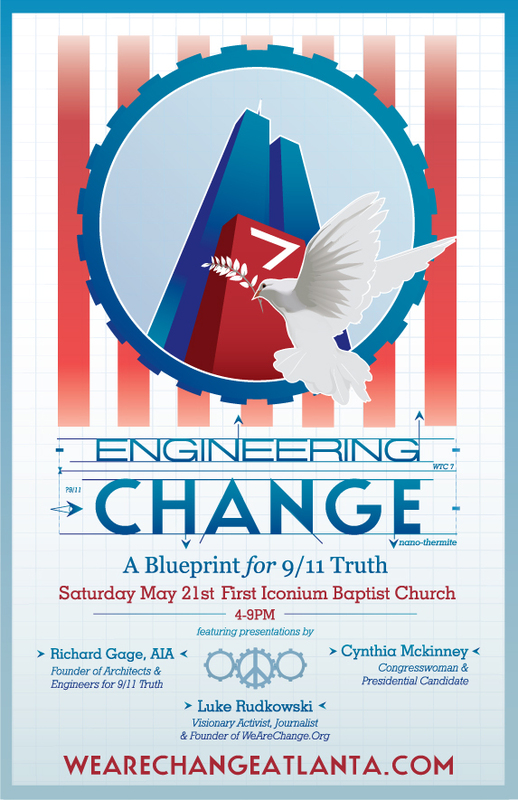 Please join us by volunteering at Ae911Truth.Org and letting them know you are ready to help “Engineer Change”. Luke Rudkowski, Filmmaker, Avant Garde Journalist, Founder of WeAreChange.org as well as April Gallop the Heroic Mother who is taking the Bush crime syndicate to court over 9/11. This event is open to the public though we do ask for a sliding-scale suggested $10 dollar donation to cover the costs of hosting this event. Crushing national debt, mind blowing annual deficits, a rising cost of living along with lowering wages with a military budget that has almost doubled since 2000. Over 1 million estimated killed during wars in Iraq and Afghanistan including over 6000 US service men and women and their devastated American families. No seeming end in sight to armed conflict… The justification for all of these realities is the epic tragedy of 9/11 burned into the soul of every American. Many experts, architects, engineers, physicists and even 9/11 commissionershave hard questions regarding the 9/11 Commission Report and are calling for areopening of the investigation as hard science is being uncovered which cannot be explained by or even contradicts the 9/11 Commission Report. If all those realities above are based on evidence which can be scientifically proven false then we as a nation must ask the question: what have we done?… and what will we do? COME and SEE just a few of these experts present their evidence on Saturday, May 21st.